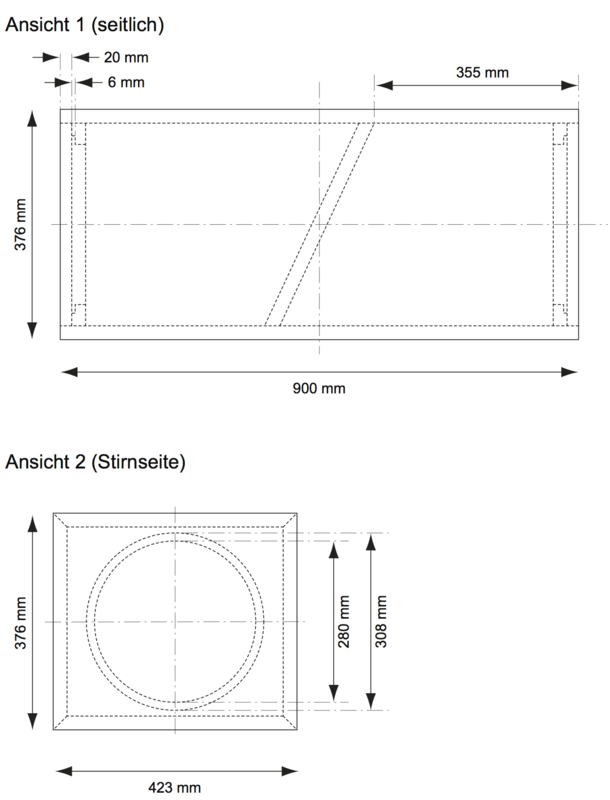 I designed this subwoofer (Photo 1) for flexible use in high-quality audio systems. In particular, I use it in my own system in combination with the S24. The subwoofer uses two Peerless XXLS-P830845 12-inch long-stroke woofers. 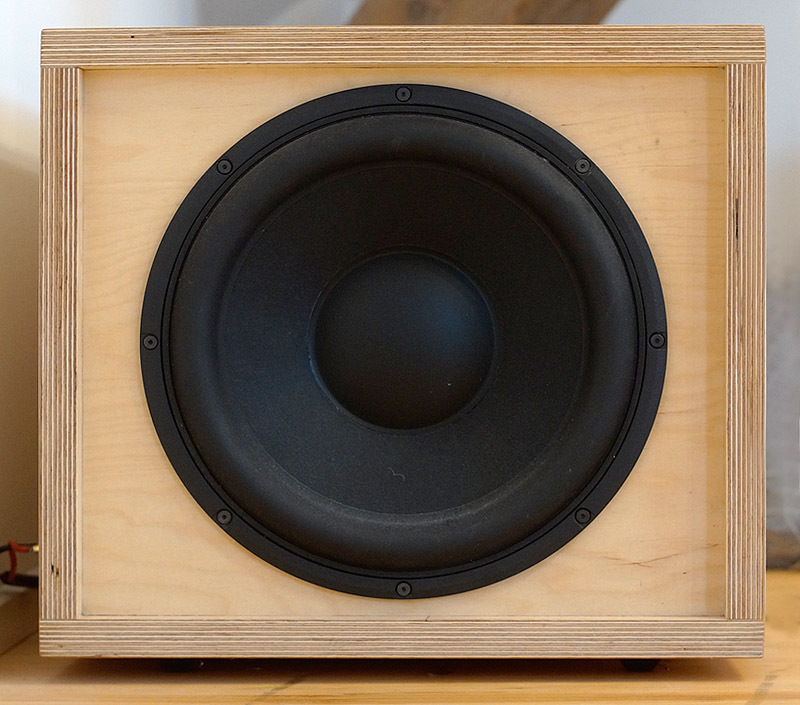 Each woofer is mounted in a separate closed box. The woofers are mounted opposite to each other to cancel the vibrational forces acting on the enclosure. Each woofer is driven by a dedicated power amplifier. An active DSP with adjustable low-pass filters is used match the subwoofer to the main loudspeakers. In addition, the DSP provides a Linkwitz pole-zero equalisation, which is tuned yield a flat acoustic frequency response down to a -3 dB point of 21 Hz. The quality factor was set to Q = 0.65, which results in a very well-controlled impulse response. 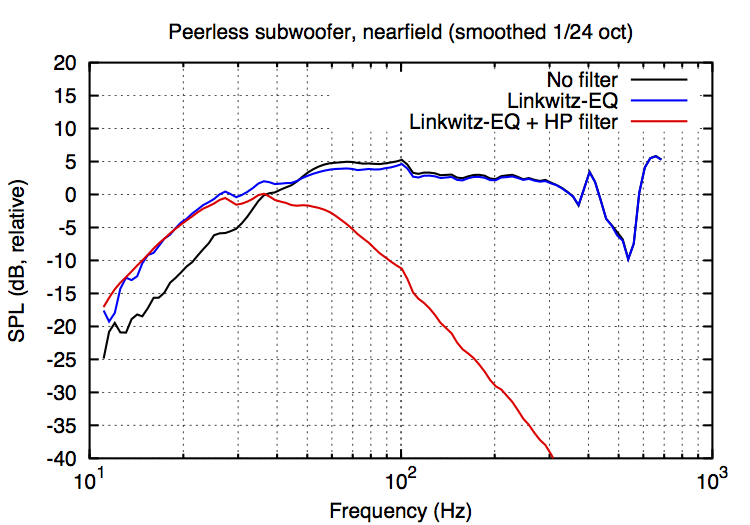 Impedance curves of the two Peerless XXLS-308-8 woofers mounted in the box, and theoretical impedance of a woofer-box system with f0=45.5 Hz, Q=0.94, and RDC=5.8 Ω. 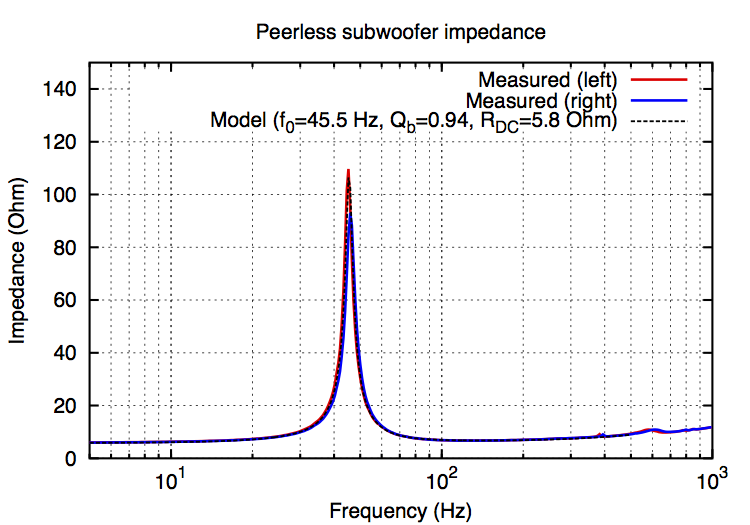 Frequency response of the Peerless Subwoofer, measured in the nearfield to gate out room echoes. Linkwitz pole-zero equalisation from f0=45.5 Hz, Q=0.94 to f0=21 Hz, Q=0.65. High-pass filter (18 dB/oct) is a cascade of a second order filter (fc=47 Hz, Q=0.7) and a first order filter with f0=118 Hz (determined experimentally for use with the AOS S24). This entry was posted in Speakers by matthias. Bookmark the permalink.